Hi guys! Did I even wish everyone a Happy New Year in my past post? I was in such a hurry to explain where I've been the past few weeks that I was forgot common decency! 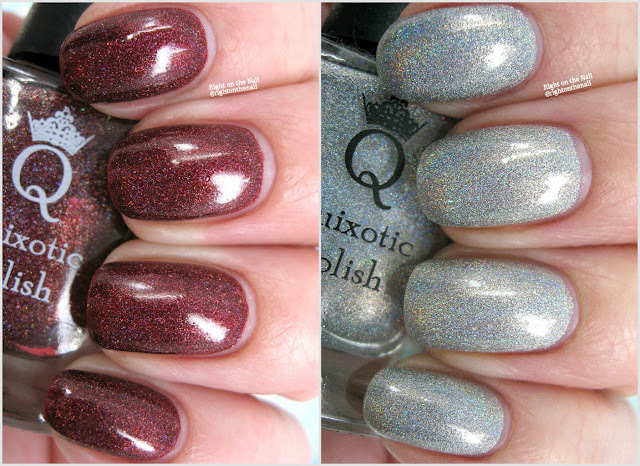 I have 2 New Year duos to show you, and the first set comes from Quixotic Polish. I've been showing Mary's colors a lot the past few months, and that's because I've been so smitten with them. She recently revamped her brand so you'll see a new logo and bottle shape here. Shall we take a look at her newest offerings? Ugh, my photos for this one are sub-par. Ring in the True is a gorgeous deep red shade with an intense holographic finish. Seriously, if want a polish that is a showstopper, this one is for you. It looks like there are different micron sizes of holo particles in this one, which adds an interesting depth. It only needed 2 coats for full opacity, and it basically applied itself. It dried quickly and left no texture with a topcoat. Wowzers, so much holo! This Is Your Year is a bright silver shade with a strong holographic finish. Unfortunately it was cloudy when I swatched these, otherwise I would have shown just how crazy these polishes are. It was a little sheerer than Ring In the True, so I ended up using 3 thin coats for the photos above. No doubt about it, this isn't a holo topcoat! The formula was just as smooth as the one above. There you have it! These are still available individually for $11 each, or save yourself some money and get both for just $20. If you haven't done so, come join us in the Quixotic Polish Facebook Fan Group for fun discussion and giveaways. Stop by the Quixotic Polish website, Facebook page, or Instagram pages to find out more.